The term “sustainability” raises questions about a better way of life, a better relationship between humans and their environment. Can poetry do justice to the subject – and still live up to its own aesthetic standards? Can we develop a “language of sustainability” that transcends simplistic slogans and naïve idealism? Can sustainability foster an innovative poetics of its own – and does poetry hold a key to a sustainable way of living? And how do perspectives differ in the German and the American poetry scenes? On April 10, 2011 at Parlandopark a German and an American poet, Lars-Arvid Brischke and Donna Stonecipher, discussed these and other questions and read their poems and collaborative translations, which will be published in the next issue of the online magazine no man’s land. – Efficiency – a good poem does not have a single word too much, overall it manages with fewer words (poetry as a “small” literary form). Clarity through concision and multiplicity of meaning through compression (the metaphor as a means of realizing this in poetry) enable the mental and emotional “immersion” by means of which both the poet and the reader can “find themselves” or “find the world”. The poem can also serve as a bridge between the “I” and the world, contributing toward a holistic perception of the “I” within the world. Poetry is slow food in contrast to the fast food products of the Teramachine. – Sufficiency (Quality, not quantity) – in a poem, you limit yourself to what seems most important, be it the content/message, sound, rhythm, connotations, wordplay, insight. – Consistency (application of the cyclical principle to resource use, substitution of non-exhaustible resources for exhaustible resources) – if every use of language is a “recycling” of words, poetry works against “downcycling”, i.e., the devaluation of words, expressions, etc., their reduction to catchphrases, hackneyed boilerplate, etc. Instead, poetry “upcycles”, enhancing language through re-use (in new or unaccustomed constellations) – thus lyrical means can be used to make the most banal texts shine or resonate once again. – Permanence – one of the most fundamental features of literature: that it does not “age”, or only very slowly, i.e. a good poem defies fashions and movements, aiming at timelessness in the sense that even after years or decades it will still have a message for people, touching them, offering insight, not leaving them indifferent. [The capitalist world] developed… into a wonderful, terrible world of commodities with a tendency toward excess, a conveyor belt connecting everything, what Ivan Illich aptly referred to as a “megamachine”. The mega- turned into the giga- and now the teramachine… The teramachine tries to appropriate everything, assimilate it into its metabolism… for it is an energy junkie, its energy supply always at the point of collapse… Poetry has an intrinsic resistance toward this appropriation. It is unutilizable for the teramachine, has no nutritive value, is unfit for consumption. Brischke added: “What is also important to me is the significance of poetry as an “exterritorial” area, a parallel world to that of the teramachine. It is also a model for a low-resource yet intensive way of spending time, thus dropping out of the teramachine – at least at times and temporarily – without immediately falling back into the clutches of the teramachine’s consumerist attractions”. From the perspective of the teramachine, which accepts no one outside itself, poetry is totally off-based. Writers and readers of poetry… [understand each other] perfectly in the way of a clique or a clan, and their circles are highly inaccessible for teramachinists. But poetry is famously inaccessible even for non-teramachinists! Brischke has written that his colleagues working in renewable energies also have difficulty understanding poetry or taking it seriously; thus contemporary poetry can remain inaccessible even for people who share its concerns. Is this a problem, I asked, and is there some way to address it? Now that we had explored the teramachine, I asked Donna Stonecipher for an explanation of the “terrarium” and how it relates to landscape in her poem cycle “Landscapes and Terrariums”. 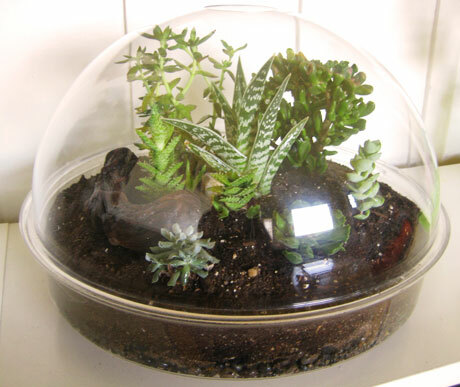 First she pointed out that she had a very specific kind of terrarium in mind (see photo) that she remembered seeing advertised in magazines as a child. It was supposed to be an enclosed, self-sustaining system, an idea that she always found both compelling and “creepy”. In her poem cycle, the “terrariums” jarringly contain images of garbage being shipped from 1st -world to 3rd-world countries, a cycle that itself is perversely self-sustaining. Each “terrarium” is juxtaposed with a landscape – not a natural landscape, however, but a landscape painting as viewed in one of Europe’s great art galleries. The fetishization and aestheticization of landscape seen in classic landscape painting is – she suggested – deeply connected to the exploitation of landscape seen in civilization’s eternal cycle of garbage; the landscape genre arose at the same time as industrialization and commodity capitalism—so the landscape itself was turned into a commodity, an object of beauty for consumption and sale. I had invited Stonecipher in part because of the pervasiveness and ambiguity of landscape in her work: manmade cityscapes, “natural” landscapes that testify to human intervention or reveal themselves as mental or cultural constructs, no less mysterious for that. Her poems often seem to locate the individual within this natural/unnatural landscape, exploring how we invent and appropriate the world around us – for me an underlying theme of sustainability. She pointed out another sense in which poetry is concerned with sustainability: it maintains the richness and diversity of a resource – language. As an American living in Berlin, she is particularly interested in the idea of English as an “invasive species” that has come to pervade even German poetry. She put forth the notion that poetry, which is, as Robert Frost said, “what is lost in translation,” is, due its emphasis on the materiality of language, on the signifier rather than the signified, uniquely suited to conserve and preserve both individual words (poets are notorious fetishizers of particular vocabulary) and systems of thought in which the language that conveys them can’t be reduced down to some transferable “meaning” that exists outside language itself. The disappearance of languages around the world is accompanying the disappearance of animal and plant species, and while poetry can’t reverse this fact, it can offer a site of resistance to it. Finally, I asked Donna Stonecipher to give some examples of American poets working with subjects or concepts related to sustainability. She mentioned poets working with “erasure,” a homegrown American form/technique, and named works by Ronald Johnson and Stephen Ratcliffe, who erased portions of existing texts—Paradise Lost and Shakespeare’s sonnets, respectively—to create a work of their own – a perhaps unconscious example of the principles “reduce, reuse, recycle”. She pointed out that erasure could be considered a form of response to the overwhelming amount of “stuff” Americans accumulate and then feel overwhelmed by—the sheer onslaught of matter we are buried under thanks to late capitalism. Or the conceptual poet Kenneth Goldsmith, who created books (based on the transcription of weather reports, or an entire issue of the New York Times) which he specifically advised readers not to read. The poetry lay in the concept alone; the work itself and the physical object of the “book” could just as well be dispensed with – the ultimate reduction principle. For me, the entire discussion, both with the poets and with the audience, showed how fertile the idea of sustainability is above and beyond its scientific applications. It is not a slogan, but a metaphor, one that holds a multiplicity of meanings.